With US equities seeing early weakness to sp'2045, the VIX saw a morning spiky peak of 17.19, but settling +2.3% @ 15.80 (intra low 15.23). Near term outlook offers the sp'2020/10 zone, which should equate to VIX (if briefly).. trading in the low 20s. 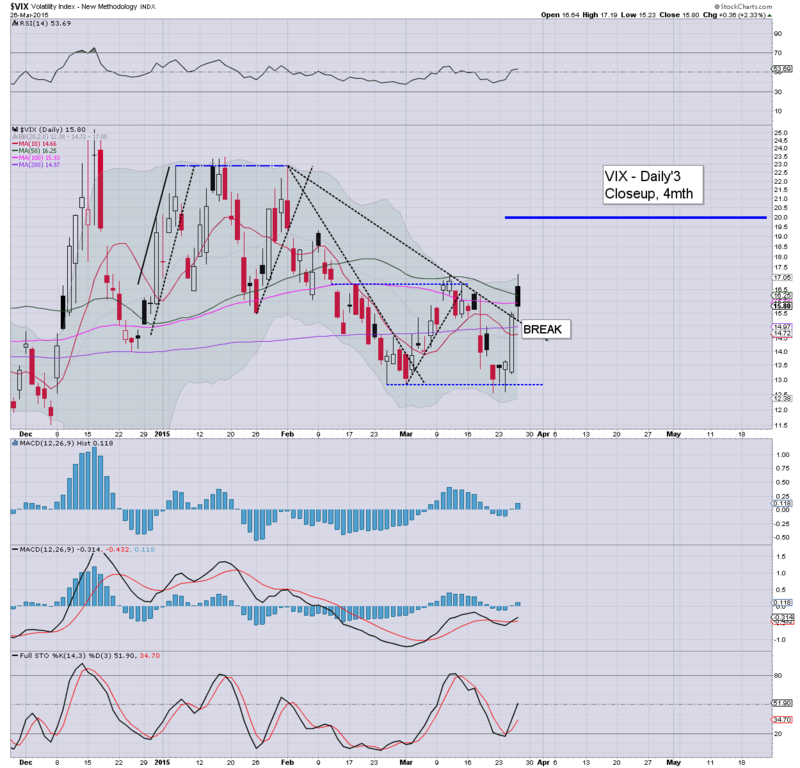 *I would only normally highlight the VIX weekly chart on a Friday, but it should serve as a reminder today of 'best upside case', into early next week. Typically. we'll likely get stuck in the low 20s. VIX remains 'relatively' low, and at best.. might be able to briefly trade in the low 20s within the next 1-3 trading days. 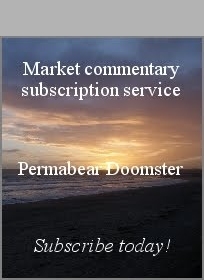 The pre-market declines were offering an open around 2040.. so.. the morning decline to 2045 was no surprise. 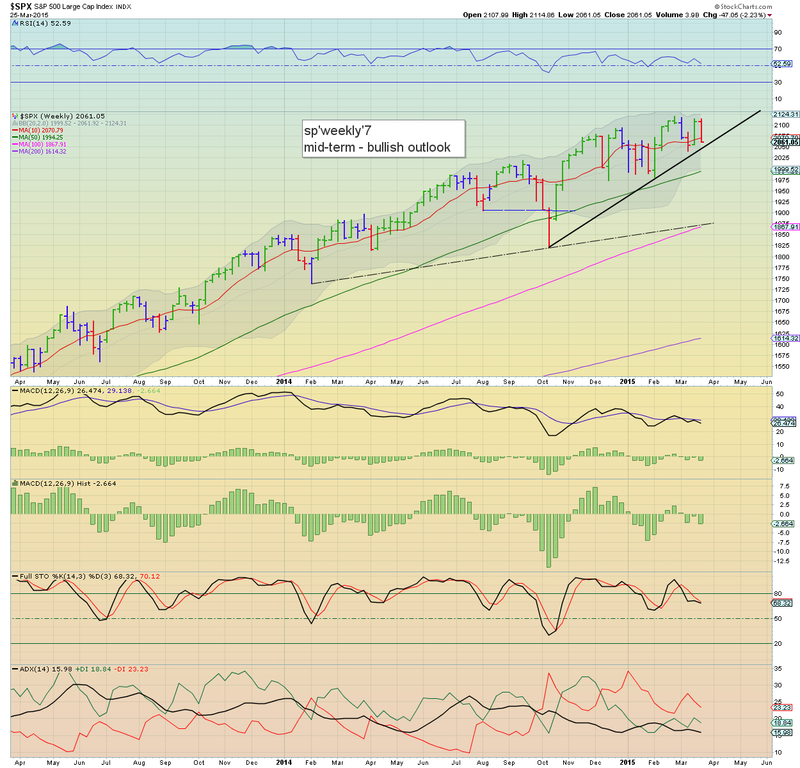 No doubt some will (understandably) believe the March'11th low of 2039 will hold. 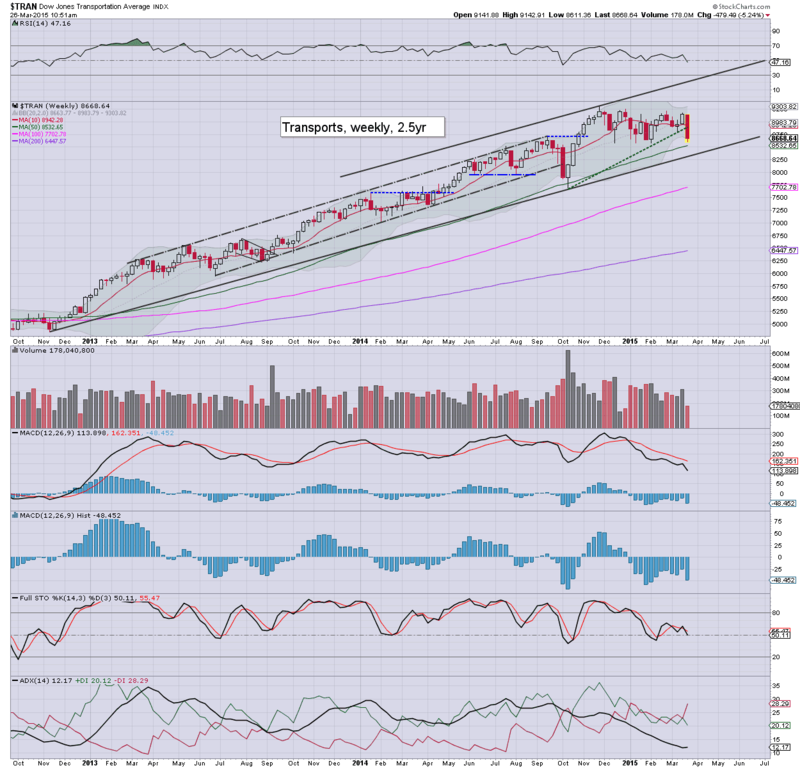 As things.. with so many clear breaks on the daily charts (see later post at 8pm EST) - lead by the Transports, it would seem we'll continue lower into next week. Things really only get exciting for the equity bears on a break of the 200dma.. which next Monday will be around 2010. If that fails to hold... then 'best case downside' is around 1960/40.. but for now.. that is more of a wistful hope... than anything. US equities look set for renewed weakness into the daily close, having already started to cool from the earlier bounce high of sp'2067. 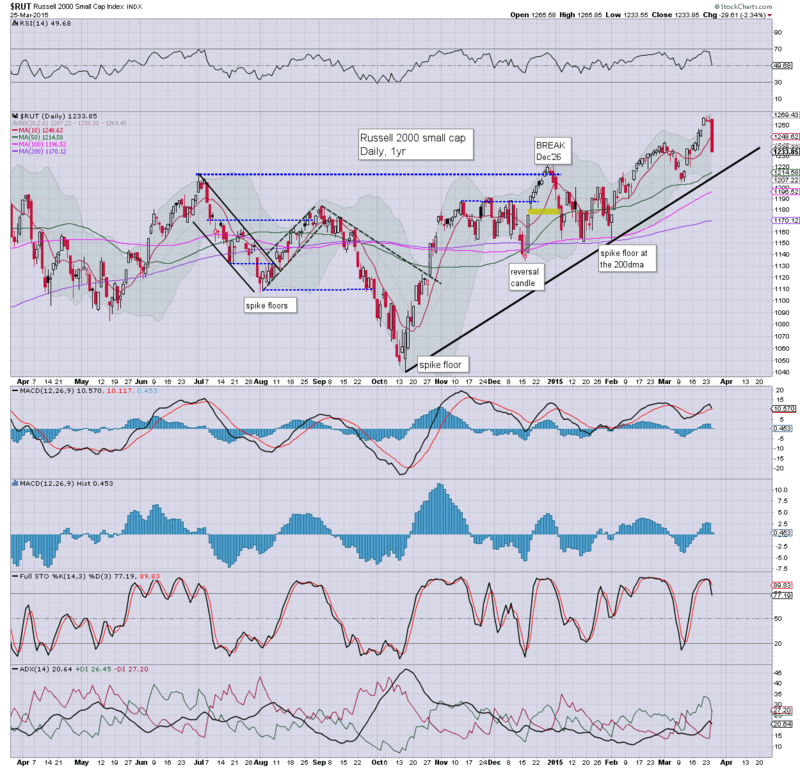 A fourth consecutive net daily decline looks probable for all indexes, with VIX due to claw back into the 16s. Oil has built powerful 'war gains' of 4.7% into the $51s. A daily close in the sp'2050s looks very likely.. along with VIX 16s. Notable weakness: precious metal miners, GDX, -2.0%.. despite Gold +$9. 3.12pm... It remains choppy... but I'll hold to the above closing targets. Certainly.. just who would want to be holding long overnight? I'd expect some of the rats to hit the sell button in the closing few minutes. 3.30pm... Well.. half hour to go... market looks weak into the close.... another key break.. <2040 looks viable tomorrow.. which will give clarity for how we will trade early next week. Typically.. we'll get stuck this hour.. and roll lower into the close. Clearly.. the 2040s look out of range.. but a fourth consecutive net daily decline still looks probable. US equities are seeing some moderate chop after the earlier low of sp'2045. There will be some significant resistance at the rapidly declining hourly 10MA.. which at the close of today will be around 2060. A fourth consecutive net daily decline still seems probable. Not surprisingly, VIX has rapidly cooled... and has already fully filled the opening price gap. VIX weekly cycle is offering the low 20s... but that is far more likely early next week than tomorrow.. even if we fall into the sp'2030s. So.. lets see if the market can roll over again into the close... which frankly.. seems more likely than not. Considering the weekly cycle charts... it is difficult not get at least 'marginally excited' about continued declines into next week. 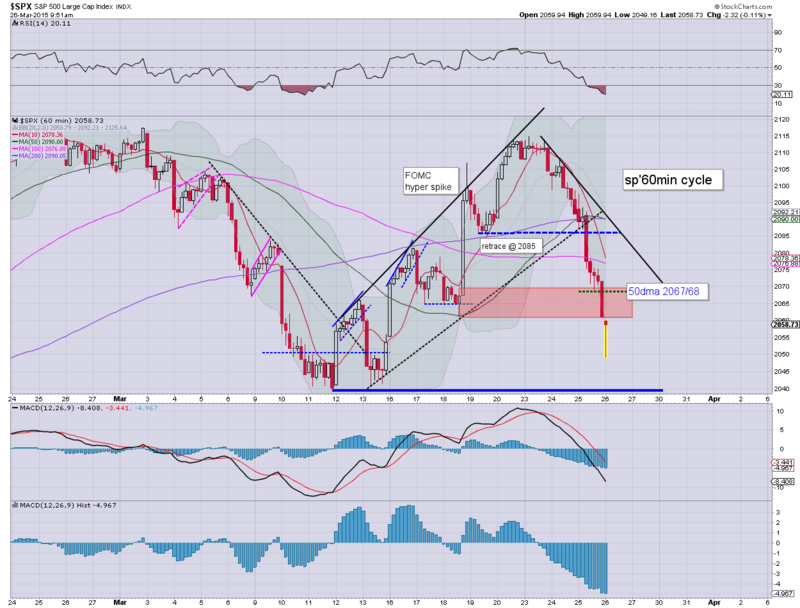 US equities are seeing a natural bounce.. having made a new cycle low of sp'2045. The bigger weekly cycles are highly suggestive of lower levels into early next week. Metals are holding 'fear bid' gains, Gold +$9, with Oil +2.8%. VIX has rapidly cooled from a morning high of 17.19 to the 15.80s. 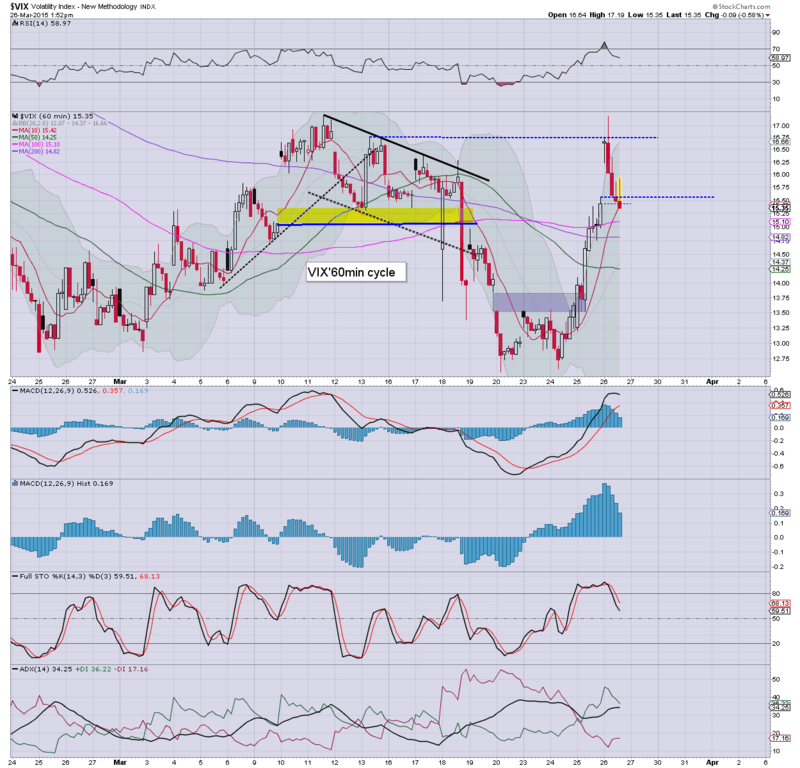 *I wanted to highlight the VIX, to note the viable upside early next week.... the 21-23 zone looks a viable target is sp'500 test the 200dma. Suffice to say... its been an interesting four days.. having fallen from sp'2114 to 2045. Whether you want to call it a C, 3.. or 'whatever' wave... the bigger picture is again teasingly bearish. As ever... the style in which we close March.. that will be pretty important... and could help shape how we trade into the early summer. 12.34pm... First resistance is the hourly 10MA... which at the close of today will be around 2060. Certainly, a daily close under 2060 looks probable.... and renewed sig' weakness into the weekend looks viable.. 2030s are well within range... which would clarify 2020/10 next week. Regardless of how we close today, the bigger weekly cycles are now strongly bearish.. with bearish engulfing candles on a number of indexes. 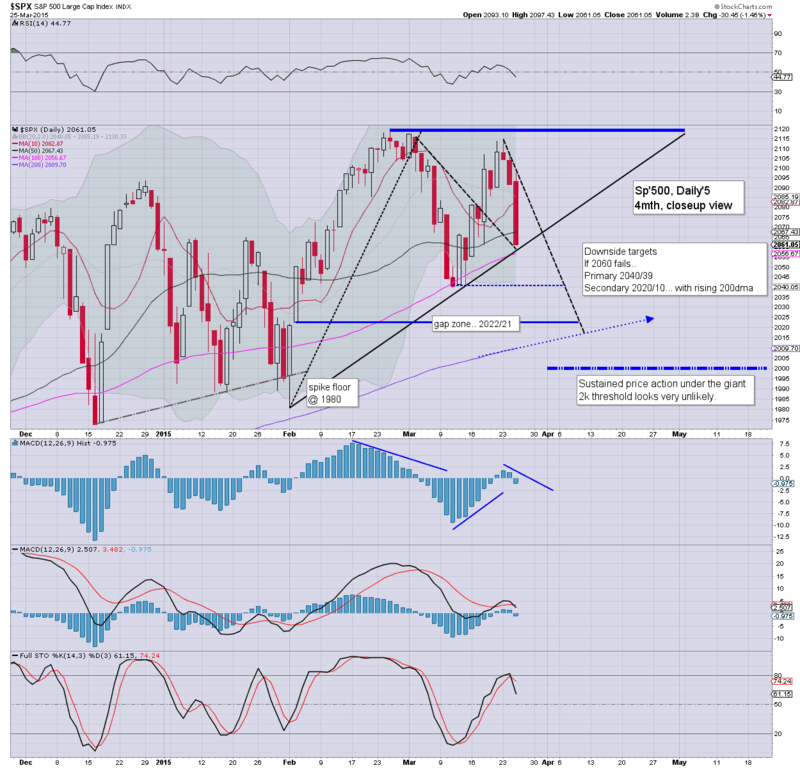 Lower lows look due early next week.. at least to the sp'2020/10 zone.. where the 200dma is lurking. Although it is notable the Trans 'old leader'.. has already breached that key MA. *as ever.. intra bounces are natural, even in an increasingly strong down trend. What should be clear... a lot of technical damage has been done since the break of sp'2085 yesterday morning. Notable 'fear bid' gains.... Gold +$10... with Oil +2.7% ... as Saudi Arabia attack Yemen. Clearly... peace in the middle east is still a few thousand years away. I guess that is bullish defence/war sector. notable reversal/strength: DIS, +0.4%.. although still looks headed for 103/02 within a few days.. having broken the up trend. 11.40am intra bounce well underway... indexes could easily turn green... but sig' damage has been done... it'd be surprising if we don't resume falling into next week. Equities have seen some notable downside follow through from the Wed' declines, but the opening hourly VIX candle is warning of an intra bounce.. that could easily see the indexes at least briefly turn positive. Metals and Oil are both catching a distinct 'fear bid'. *first, to be clear... an intra bounce would be very natural... but on no basis would I see the opening low of sp'2049 as being the low of this cycle. At the very least we look set for 2040/39... if not the lower zone of 2020/10... where the 200dma will be lurking next week. So... right now... it looks like this market weakness will drag out into early next week/end Q1. 10.01am... The opening VIX candle flips back to white... just before 10am... with the market snapping back lower. *it is notable that in pre-market.. the sp'500 was trading at equiv' of 2040. 10.07am.. VIX breaks a new high.... with sp'2048... its getting a little wild again. 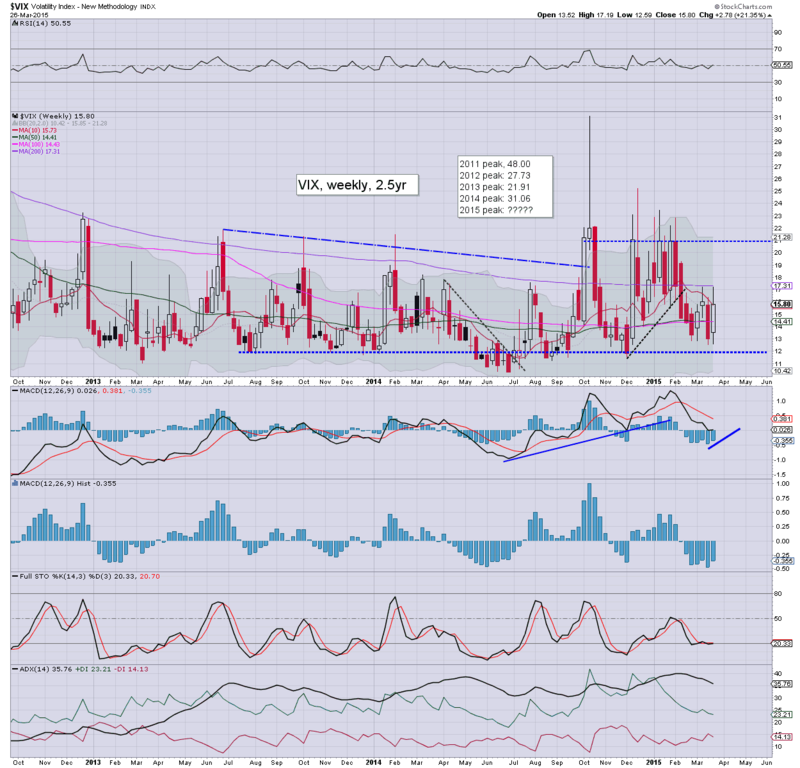 weekly VIX cycle offers 21/23 zone... but more viable early next week. That would be suggestive of sp'2020/10. 10.16am.. VIX 17s.. which is pretty incredible... having been in the mid 12s. just this Tuesday. 10.19am.. for those with eyes on the bigger picture... we now have HUGE bearish engulfing candles on the weekly cycles. It bodes for lower lows next week... sp'2010/00 zone remains a VERY natural target. Good morning. Futures are moderately lower, sp -7pts, we're set to open at 2054. With the USD remaining weak, Gold is +$7, with Oil +2.5%. So... we're set for some follow downside through from yesterday.. .and headed for at least 2040... perhaps today. Things get 'real interesting' though if we get to 2020/10 though, but that looks out of range until early next week. *jobless claims 282k... another 'reasonable' number. 9.34am. Trans takes out the 200dma... first time since mid October. However.. with a CLEAR break of 2060... we still look set for 2040... given another day or two. It was a third day for the equity bears, with the sp -30pts @ 2061, which was a fractional break of the pre-FOMC low of Mar'18th. There looks to be near term downside to at least 2040.. if that fails.. then 2020/10 zone.. where the 200dma will be lurking next week. 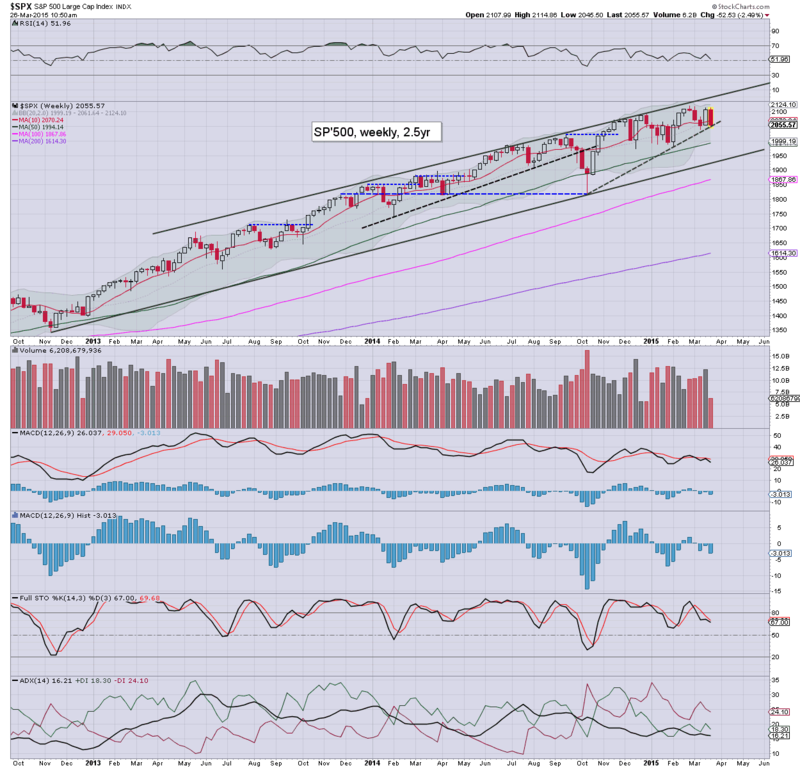 *with a third day of weakness, the weekly sp' 'rainbow' candle has turned to an outright bearish red. Based on previous cycles, we'll see a lower low (<2061) early next week.. even if tomorrow/Friday see a fairly significant bounce into the 2080/85 zone. Certainly, I'm surprised that sp'2085 failed to hold.. but with the market failure in late morning, it is was not surprising to see weakness all the way into the close. For once, VIX really confirmed the equity weakness.. although still remains at a relatively subdued level in the 15s. There is particular weakness in the two leaders - Trans/R2K. The Nasdaq is currently lower by -3.0% this week.. the biggest decline since last October. Underlying MACD (blue bar histogram) is turning negative for all indexes... and it does not bode well for the bull maniacs into end month. Thursday will see the usual jobs data, and PMI service sector data. *there are two fed officials on the loose, not least the bears number'2 enemy.. Bullard.. who is speaking in Germany. It remains notable that we are still very close (around 3%) to recent historic highs. Yet... you sure wouldn't think so by the way many are talking. It remains the case that the mainstream get real twitchy if the indexes are not breaking new historic highs each and every day. There will no doubt be a lot of bearish chatter this evening... but really, unless the bears can keep on pushing lower, and sustainably trade under the giant sp'2k threshold, this is just the same style of price action that we saw across January. I would agree that Q1 GDP (due April 29'th) is going to be a disappointment.. although that is bullish... right? After all... bad econ-news means the Fed is less likely to raise rates in June. As for the looming next quarterly earnings, I'm sure they'll come in at least 'reasonable'. Sure, energy sector numbers will be lousy, but then.. most of that is priced in. Indeed, many energy stocks did well today... along with Oil.. despite another 8 million barrel surplus. At least today wasn't tedious! US equities closed lower for the third consecutive day, sp -30pts @ 2061. The two leaders - Trans/R2K, settled lower by -2.0% and -2.3% respectively. 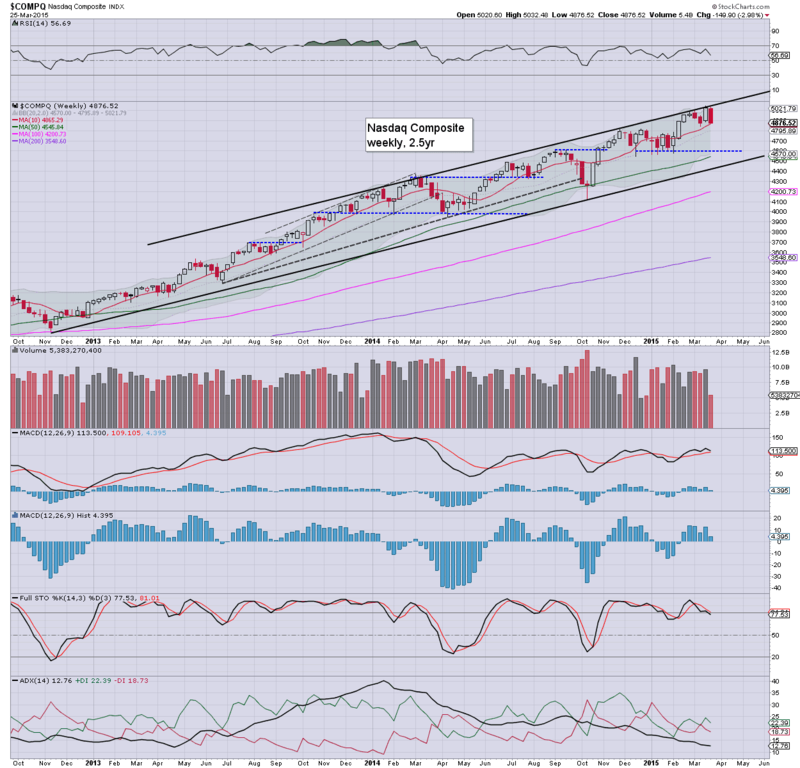 With the loss of the 50dma (2067), market looks set for continued downside to at least 2040... if not the 2020/10 zone. 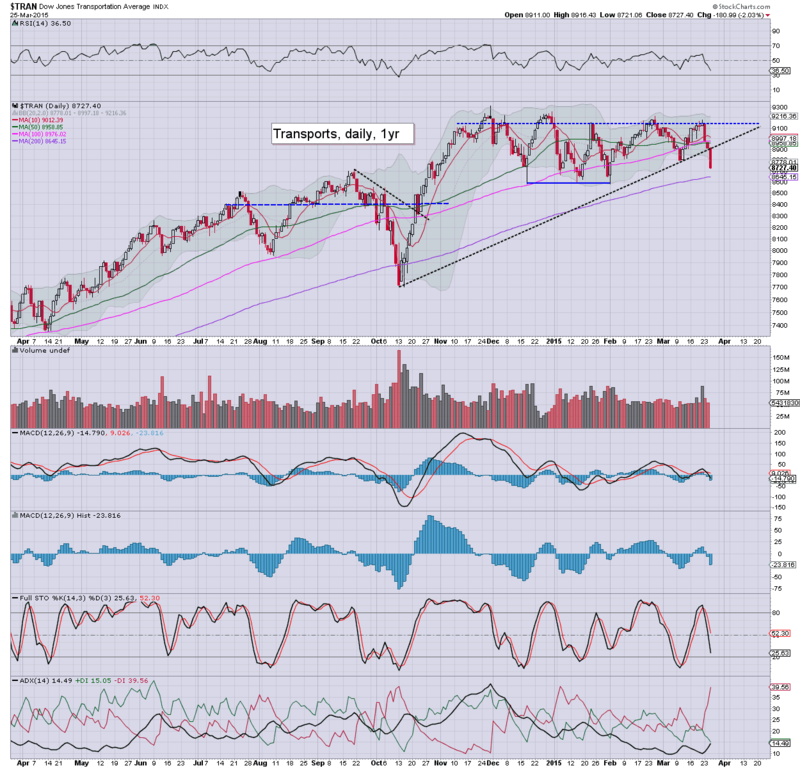 *a rather notable decisive break of rising trend for the Transports. A pretty interesting day for the market. It looked like we had floored around 11am at sp'2087 - 2pts above the retrace low, but within minutes.. .a very significant fail. The failure of 2085 to hold lead to a swift snap lower... all the way into the close. With a daily close under the 50dma.. there is now viable downside to 2040 by the Friday close. 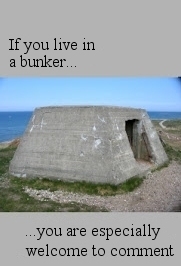 Yes.. I'm surprised.. although overall price action is nothing that merits any of the doomer bears to get overly excited. For that.. we'd need a clear weekly/monthly close <sp'2k.